Walmart’s execs know a money-making scheme when they see one, and they’ve zeroed in on Groupon’s consumer money-saving coupon model as a good thing. So they’re launching their own version. Kind of. Walmart’s execs know a money-making scheme when they see one, and they’ve zeroed in on Groupon’s consumer money-saving coupon model as a good thing. So they’re launching their own version. Which … makes them more money. What? Walmart’s Crowdsaver system, available on the retailer’s Facebook page, works a lot like Groupon, but in a way that benefits the retail giant much more. Plus, it holds tight reins on the system. 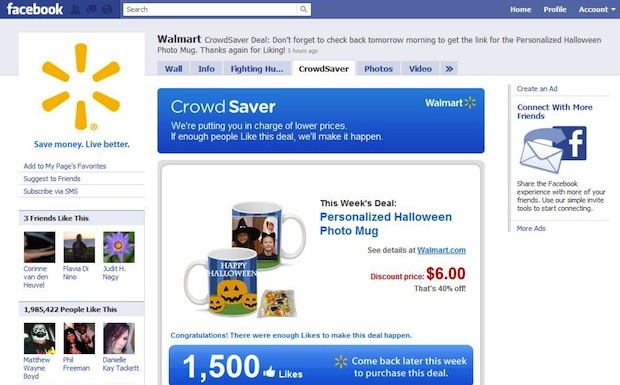 Walmart suggests products in the Crowdsaver window, and if enough Facebookers “Like” Walmart’s idea, the products in question get discounted. There are a few provisos: Walmart gets to choose the product; enough people have to “Like” it inside a time window Walmart chooses; and Walmart gets to set the discount price. they’re not really driving this vehicle. Crowdsaver, but rest assured Walmart’s well aware of that trick already. No matter how much you all “Like” an iPad, you’re not getting it from Walmart for $49.95. 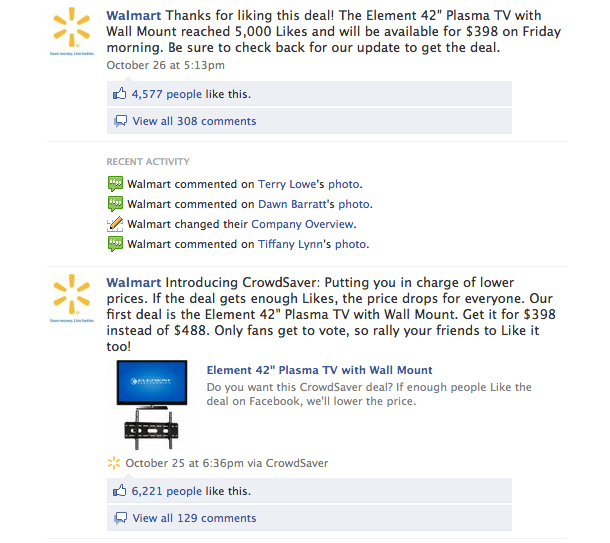 They did, however, offer a 42″ plasma TV for $398, down from $488 after more than 5,000 Crowdsavers “Liked” it.